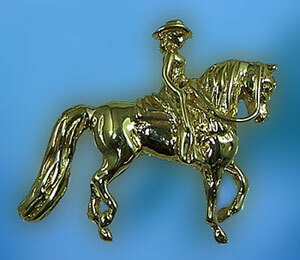 Morgan western pleasure pendant great for the western rider at your barn. The Gorgeous Horse your number one source for Morgan horse jewelry. Here we have a new western pleasure Morgan horse pendant offering exceptional three dimensional designs featuring a female rider. This piece is sure to please any Morgan horse lover. Ride away with one today! Dimensions: 1 inches wide x 7/8 inches tall. Available in 14kt yellow gold,14kt white gold, and sterling silver. Customize this design to your liking, try this piece with a brushed finish to show extreme detail or add diamonds to the mane and tail!